Now that the auto industry is rocking huge sales numbers, automakers are bringing back niche cars, like sporty, rear-wheel-drive (RWD) coupes. Cadillac’s 2016 ATS Coupe is less practical than the sedan, it’s not as good in the snow as the company's front-wheel drive (FWD) cars and all-wheel-drive (AWD) crossovers are, and it's not especially large, but oh, does it look so much better than the everyday sedans for sale over at its GM siblings' showrooms. The Cadillac ATS was born in 2012 as a 2013 model-year sedan. Cadillac initially eased into this new vehicle. Slotted below the CTS, the ATS at first was offered with excellent but not especially powerful engines and in rather conservative-looking clothes. Now we see exactly what Cadillac can do with a fine platform. The Coupe launched in 2015 with some very notable features and a look that's more pleasing. And finally, Cadillac took the wraps off an all-new engine with berserk horsepower and called it the ATS-V (which we cover separately). The 2016 Cadillac ATS Coupe features conservative styling similar to the sedan's, but it works so much better on the coupe. Starting at the front, the ATS has a bold but elegant grille that features the company’s updated logo. The headlights, when viewed from the side, seem to be melting and dripping backward. The long side doors and hidden B-pillar give the car a long, low look. The rear is also executed in a way that makes a statement. The rear lights have a sharp look to them, and the big Cadillac logo under the rear lip spoiler is not out of place. Down low the twin exhaust pipes are closer to the center of the car than many others, and it's a look that hints at power. The 2016 ATS Coupe offers a choice of two engines, and both are available with RWD or AWD. The first is a 2.0-liter turbocharged 4-cylinder making 272 hp. That's impressive, but it's the 295 lb-ft of torque that Cadillac emphasizes. That's more torque than BMW’s 428i offers. Cadillac also offers a manual transmission with this engine. One veteran automotive writer we know tested the ATS and chose that combination. He was thrilled with the power, fuel efficiency, and the ability to choose his gears. The second engine is GM’s gem of a V6. Displacing 3.6 liters, this engine does not need a turbocharger to pump out 321 hp. This engine is mated to the 6-speed automatic standard on the turbo engine mentioned above. Together the power delivery is class competitive. Either engine will pull get to 60 mph in around 5.5 seconds. On public roads that's plenty quick. Cadillac built the ATS platform to compete head to head with the world’s best sedans and coupes in its size and price range. That means the BMW 3 and 4 Series, the Audi S4 and S5, and Lexus’ IS and RC lines. The consensus is that the ATS does compete, and that's really the trick. There's no single way to choose a “best” from this exclusive club. Too much depends on a driver’s particular wants and preferences. For whatever it's worth, GM’s Camaro line is moving to the platform and factory the ATS uses. GM knows this vehicle’s platform has it where it counts. Inside, the 2016 ATS Coupe can be outfitted in a manner that fits a world-class luxury touring car, or it can be quite plain. 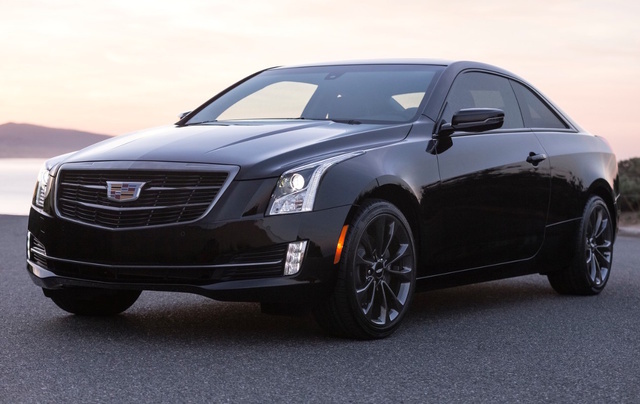 The base ATS Coupe comes with leatherette seats and no navigation system and starts at just $38,000. Cadillac can offer this low starting point, and it can also offer trims that live up to the Cadillac promise of luxury and refinement, but not at the same time. Be careful to budget $45K if you want the good stuff. That good stuff includes microfiber suede interior surfaces to augment fine leather. The CUE infotainment system is always there, but it, too, has levels of content. Working in conjunction with OnStar, CUE delivers everything one might find in the most modern of cars. For example, for 2016 the ATS Coupe’s OnStar vehicle monitoring and other services are included in the price for 5 full years. OnStar’s 4G LTE Wi-Fi is included, but owners will pay for packages of data that are cheap to start but get very pricey if one plans to watch streaming video frequently. There is a CUE-based shopping site, vehicle diagnostic services that help prevent surprises like flat tires and dead batteries, and much more. The full suite of current driver-assistance safety features are available, including forward crash prevention rated Superior by IIHS. The ATS has not yet been crash-tested by IIHS, but it would be eligible for the top score due to its modern suite of active safety systems. The 2015 ATS Coupe offers the looks, luxury, sportiness, and refinement that have been the basis of BMW’s compact coupes for many years. Buyers looking for such a car with an American flavor now have a new choice. What's your take on the 2016 Cadillac ATS Coupe? fast_eddie1 I love it and it is an especially good buy as a 2 year old used vehicle. Have you driven a 2016 Cadillac ATS Coupe?